DEFENDER2.NET - View topic - So You Want a V8 Ninety? Home > V8 > So You Want a V8 Ninety? I hadn't noticed it was just up the road! Not heard of them before. Way way out of my budget though! Yes 205’s on a One Ten look silly as does the bull bar. There are a few things to correct if you wanted to be spot on wrt originality. Not sure how easy it would be to find the correct badge on the grill panel or the correct front seat bases. It’s a nice thing though, clean, tidy and useable. I would be happy to have it on the drive. The badge in the Brit-car link is a decal whereas One Tens of this age had a riveted-on plastic badge. Someone had a few of these re-made and they were a pretty good facsimile. Probably all gone now. I don't think Exmoor have a match for the Brushwood trim (stand to be corrected) but a chap on eBay was selling some of the original material by the metre. I bought several metres for when I get round to having my seats repaired. Correct parts for these early One Tens are getting harder to find new, and owners need to keep an eye out because even used parts like split door trims are getting harder to find. Poorly/cheaply restored vehicles will become the norm. 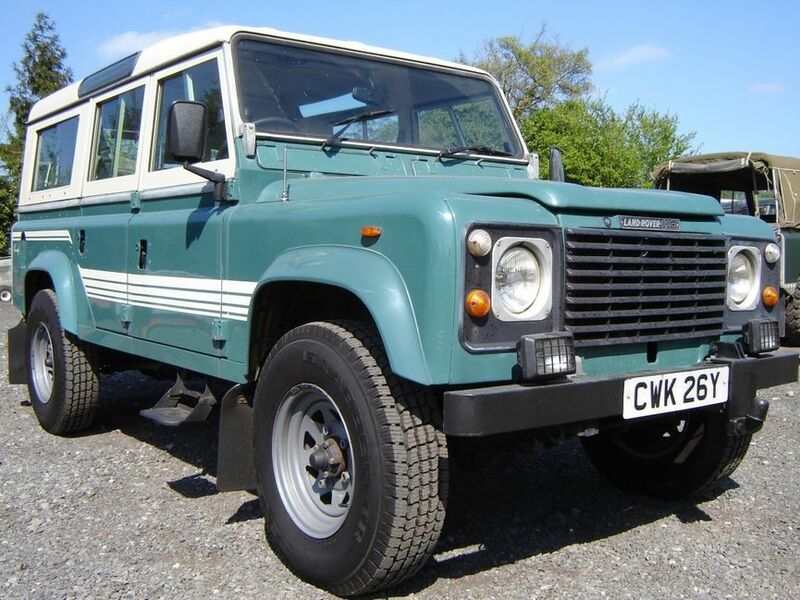 The parts list (One_Ten up to 1986) doesn't list a badge on the grille panel, though it details the body tapes and "county" badge. The MUC2003 badge is listed for the 1984 facelift models. Also read a couple of articles about the original press launch and the vehicles pictured therein had the decal fitted. The brochure for the early One_Ten (brochure LR229/2.82/200M) shows all of the vehicles with the decal type front badge. You need the earlier (first) One Ten Parts Catalogue, dated September 1983. I have three early One Tens, they all have the plastic badge. There is a facebook group specifically for prototype, pre-production and early production One Tens, with many owners of slidey-window One Tens on there including those of us who have studied them for years. You could go on there and suggest these vehicles had decals rather than plastic badges! Yes, that is an interesting vehicle in the LRO link. It belongs to me - and has the plastic name badge! The decal would have come in with the facelift models (or possibly with the last slidey-window vehicles, if stocks of the badge had run out). The earliest Parts Book also gives MTC 6224 as the seal for front and rear side doors. This Book is so early it contains some inaccuracies and even some pre-production parts that did not make it onto production vehicles. Subsequent Parts Books tidied up the inaccuracies, so if the later versions still give MTC 6224 I would expect it to be correct. (Haven't bought that part myself). If it doesn't fit, that is interesting. The facelift One Ten launch coincided with the launch of the Ninety in June 1984. However, I have seen precious few A plate facelift One Tens, which makes me surmise that they were mostly selling off the old models first and didn't supply many facelift models until the B plate came in on 1st Aug 1984. What would be interesting is if anyone has spotted a facelift (wind-up window) model with the plastic grille badge, rather than the decal. The brochure I have shows them with galvanised bumpers. Or is that just my old eyes deceiving me? 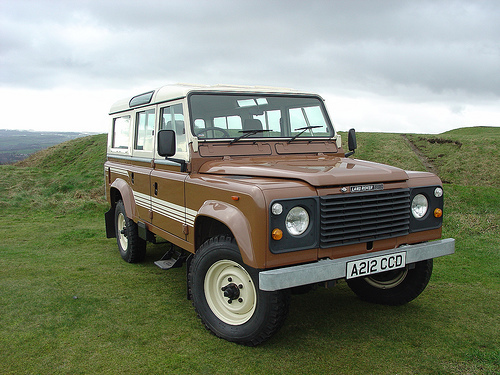 I remember reading somewhere that Land Rover recalled all the unsold early vehicles and selling them through Bristol Street motors, but that was years ago and we all know how reliable journalists are. In the case of the seals the book shows the same part number for both doors and, having ordered a pair for mine own rear doors, they very definitely don't fit. I ended up using a pair of pattern series front door seals. If you order using that part number these days, you end up getting WOLF front door seals, which are completely different. Don't know if it is still the case but Craddocks had some NOS rear door bottoms. I also had the misfortune to buy a pair of new upper door trims, advertised as being for the rear doors, turned out to be for the front doors. When I sold them, they raised the princely sum of 9p on eBay after a furious bidding spree in the last few seconds. Bought by somebody from New York. Some years ago I used to see a CWK reg station wagon quite often, caramel coloured, navigating parliament square before going down either Victoria street or, occasionally, Great George street. Couldn't tell you which engine because I always had a helmet and ear plugs and couldn't hear it. 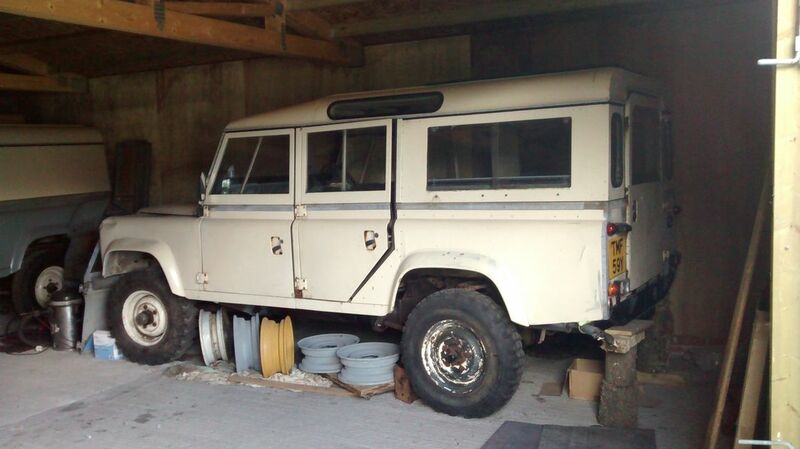 Also remember seeing an early camel trophy 110 Csw with selectable 4wd, registered in Switzerland, for sale on eBay. Remembered the name of the place. A "caramel coloured" Station Wagon would probably be Limestone all over. (All sliding-window One Tens had Limestone uppers, no matter what the lower colour was). All-over Limestone was not a popular choice in the UK because there was a whole range of new exciting colours now available, so this colour went mostly overseas to warm climate countries, as white was not a standard colour until, I think, the facelift models. Not sure which bracket you mean. If you could take a photo of the location, with an arrow pointing to where it should be, that might help. No, my eyesight isn't quite that bad, the vehicle in parliament square had the limestone uppers but the lower was very definitely a caramel colour, not as dark as the brown, not "sand glow" either, lighter than that. Not saying it was an original colour. Vehicle was in immaculate condition though. Thank you for the kind offer, I'llll see what I can do about pictures, probably some time tomorrow. Ah yes - the clue was in the title of the advert wasn't it? !